Product #45731 | SKU DRDP3LTIK | 0.0 (no ratings yet) Thanks for your rating! 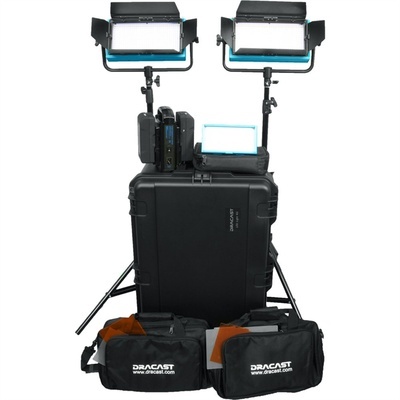 Create a 3-point lighting setup with ease using the tungsten-balanced Interview Plus 3-Light Kit from Dracast . It packs together two LED500 Plus LED lights for getting high output in a small package along with a small LED200 on-camera LED light for more mobile setups. Besides the fixtures, the kit also includes two 90Wh V-mount Li-ion batteries and dual V-mount battery charger as well as four-way barndoors, filter frames, and filter sets for the LED500 panels. Additionally, two light stands and hard carrying case are included. Expanding on their line of panels, the LED500 Plus Series Tungsten LED Light from Dracast adds a digital display for adjusting output as well as Cat5 DMX input and output for linking and comes with both Gold mount and V-mount battery plates. The light features 512 LEDs with a high CRI of >95 for excellent colour accuracy. Also, this model has a tungsten-balanced colour temperature of 3,200K for matching with other fixtures. The lights offer a spot beam angle of 45° as well as dimming from 0-100%. Benefitting operation, it can run off of either a DC source, such as a Gold mount or V-mount battery, or a universal 100-240 VAC adapter. The light is durable as well with an aluminium chassis, frame, and mounting yoke and it only consumes 30W of power. Additionally, it is lightweight at just 4 lb and measures 12 x 6 x 2" in size. The Dracast 90Wh 14.8V Li-Ion V-Mount Battery is a memory-effect-free battery for professional camera systems. It features built-in electronics to protect the battery during charging and use, charger is not included with the battery. The 5-LED battery system provides an indicator that shows you how much capacity the battery has left before it needs to be charged. It incorporates a D-tap power outlet, so you can power accessories directly, instead of through your camera's electronics. With an operating temperature range of -4 to 122° F, the battery will keep working even in deep cold and extreme heat. The Dracast Filter Frame for LED500 allows the use of Dracast or other brand diffusion, CTO, CTB or effects filters with the fixture. Constructed of lightweight aluminium, the frame drops into the fixture's accessory channel. It has a frame lock to prevent filter slippage. The Dracast 5 Filter Set for LED500 Light contains rigid light modifiers that measure approximately 12 x 6" to match the fixture. Included in the kit are one each: 1/4, 1/2, and Full CTO filters to change the light's daylight balance to tungsten. A Half White Diffusion and an Opal Frost Diffusion Filter are also included to soften the light's output. The DLS-805 Spring-Cushioned Light Stand from Dracast extends from 3' to 7.2' and has a load capacity of 13 lb. It folds down to 36" for transport, and weighs 4 lb. There is a 5/8" stud on top of the stand. Military-Standard Waterproof Case 10 (Empty) from SKB is constructed of ultra high-strength polypropylene copolymer resin and sealed against dust and water. The hard outer shell is impact-resistant and features a rubber cushion grip handle, built-in wheels, and a pull handle for easy transport. The case is compatible with TSA latches so you can keep your equipment secure while still conforming to airport security requirements. An automatic ambient pressure equalisation valve self-adjusts based on your altitude. The case is resistant to UV, solvents, corrosion, and fungus, making it the best way to ensure maximum protection for your equipment at all times. Fits camera and lighting units with V-Mount battery bracket. The built-in LED battery gauge provides you with a clear visual confirmation of the battery's capacity. The built-in D-tap connector allows you to power accessories directly from the battery, protecting your camera's electronics from potential damage due to power hungry accessories. The battery will operate in temperature extremes that are uncomfortable for most people. Please note that as a general rule, battery capacity decreases as the temperature gets colder. Cheque your owner's manual for instructions on charging cold or hot batteries.